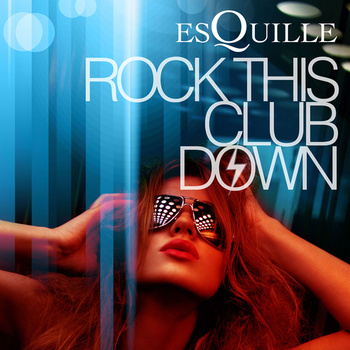 Returning to dance music after taking a few years off, Sweden-based producer/artist Esquille comes bearing the gift of his new EP Rock This Club Down. Before his self-imposed exile, Esquille spent much of the 90′s and early Aughts working on his own projects, collaborating with acts like Jam Planet, Belltree, Magic Key and contributing to A Trip In Trance compilation series. His return to electronic music is perfect timing, as EDM has reached mainstream saturation. After capturing listeners’ attention via his breakthrough singles “I Take U Higher” and “HEYO,” Esquille has dropped “Don’t Stop The Rhythm,” the first offering from his Rock This Club Down EP. The five-track release opens with the title track and “Musica Electronica,” a pair exuberant club bangers brimming with in-your-face synthesizers and grimy bass line, laced with touches of dub step. “Don’t Stop The Rhythm,” takes up its title with an almost religious fervor, keeping up the relentless pace with punchy keyboard chords and frenetic effects buzzing above the thumping drums and bass. Esquille switches things up by shifting into the hypnotic house grooves of “Moven Up” and the aptly named “House Thing.” The EP is a collection of compulsively danceable tracks destined to be the soundtrack to late nights and festivals. Rock This Club Down comes out September 15. Listen to “Don’t Stop The Rhythm,” here and listen to a mash up of the entire EP here.